The day after news of the Brexit referendum breaks I'm rambling through the fields of Flanders with a Belgian historian and three English brothers. We've started our Western Front battlefield tour in Ypres, a small, south-western Flanders town which looms large in the post World War I psyche. Between 1914 and 1918, five battles decimated the Ypres area, scarring countryside, destroying the medieval town and killing 600,000 people. My tour has travelled south, past gentle hills dotted with cemeteries, to Hill 60. This cratered, pock-marked landscape bears the scars of tunnelling warfare and the 1917 Battle of Messines. Miners of the 1st Australian Tunnelling Company lost their lives here when 19 mines were detonated under German trench-lines on 7 June 1917. They are among the many Commonwealth victims the town will remember on Anzac Day, under the Menin Gate memorial to the missing, where 6191 Australian names are etched into the marble. My English tour companions are here on a family battlefield pilgrimage and there's much I want to ask them: why does the story of an unknown relative mean so much to them today? What is their contemporary connection to Wipers, as the British in their humour dubbed the French-spelt Ypres and Flemish-spelt Ieper? Yet curiosity gets the better of me and I bring up the 'B' word. The theme of Europe's current refugee influx is close as we walk through manicured cemeteries where red roses flourish beside stark white headstones. October 1914 saw one and a half million Belgians flee their country, seeking refuge in the Netherlands, France and Great Britain. Ypres residents were forced to evacuate when the first German gas attack on the Allied frontline in April 1915 drifted toward them. Those who returned post-war found a town decimated by shelling. From ghost-like ruins, cobbled streets, houses and civic buildings were eventually reconstructed in their former medieval style. "If commemoration can be harnessed to promote the dangers of nationalism and to help people become more accepting of the plight of those who are not their 'creed', then it should always be relevant." Ypres' human collateral damage and displacement of those forced to flee is investigated at Ypres' In Flanders Fields Museum. The museum handbook parallels Belgian's WWI refugee exodus with the plight of refugees today fleeing Syria, Afghanistan and Africa, hoping to dispel mistrust and discrimination shown towards the wave of refugees entering Europe. It's one way In Flanders Fields Museum is adopting a forward-looking approach to commemoration, pulling World War I's messages and themes out of 1918 and propelling them into the 21st century. At the museum's exit, banners list global wars from 'the War to end all Wars' until today, helping museum director Piet Chielens explain how remembrance must be relevant and educational. Another layer of Ypres' progressive approach to commemoration is the City of Ypres Peace Department, which extends Chielens' message through practical programs. Peace Service coordinator Filip Deheegher embodies the commemorative 'now'. 'If you want to commemorate there must be a future perspective as well,' he says. Initiatives include a triennial local peace prize and Ypres' pioneering involvement in Mayors for Peace, an international organisation working for the abolition of nuclear weapons. At a local level, the primary school Peace Factory program brings big words like 'peace' and 'war' into children's smaller worlds. Under the vaulted ceiling of the Museum Research Centre, researchers and volunteers are currently working on the Names List project which strives to rectify the issue of inwards looking commemoration. The project breaks down 'us/them' barriers by compiling a database with the names and stories of all WWI victims in Belgium. The Museum is creating a publicly accessible, inclusive list of military and civilian war casualties, regardless of nationality. In Ypres and in Australia, ANZAC Day will inevitably evoke debate about the dangers of patriotic commemoration. There will be rhetoric about how remembrance glorifies and sanitises war. There will be questions about the relevancy of remembrance and its place in a 21st century society. Surely if commemoration can be harnessed to promote the dangers of nationalism and to help people like those three British brothers become more accepting of the plight of those who are not their 'creed', then it should always be relevant. Kate Mani is a freelance writer with published pieces in The Age, The Australian, Mojo News, Lot's Wife and Viewpoint literary journal. 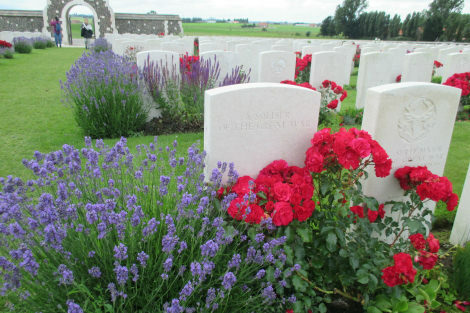 Pictured: Graves at Tyne Cot cemetery near Ypres. Recent articles by Kate Mani. I suppose, if you went out of your way to find three cliched 'patriotic Englishmen' of a certain sort, you could have done no better. Tribalism - the basis on which the former British county regiments existed - is a very strong thing. It is easy to deplore, even sneer at, but it is part of life. For instance, one of the criteria for being recognised as an Aboriginal is that you 'identify' as such. The propaganda for both the First and Second World Wars was definitely 'tribal', even xenophobic. One British news headline for World War 2 read 'We whipped five Wop divisions'. Quite deplorable at any time, really. In the 1950s and 60s some people, a minority and not necessarily ex-service, attempted to second Anzac Day to racist ends. That was despicable and ignored the contribution of nonwhite ex-service people in both World Wars. These days I think most people here who are involved in any major way do it because of family connections. They do not necessarily have any other agenda. Being an ex-service person does not necessarily mean you do not want peace: the two are not mutually incompatible. 'Peace' is one of the things most people sincerely want. Sensibly wirtten. Remembering those who gave the ultimate sacrific is vital for a modern socitey that strives for peace. Wel done and keep up the good work. "the consequences of nationalism." Nationalism is just another name for Collective Self Interest. While members of a Nation should be concerned about the welfare of their Nation, they should resist the narrow view of seeing it as the Only one that matters. We are part of the Global Community, and our future rests with promoting the welfare of the whole Global Community. Calls for selfish populist "America First" or "Australia First" should be replaced by calls for the "Global Community First", and "Our" Country to take its proper place in achieving this. I forget who said this and I will have to paraphrase, but it goes something very close to: 'those who have no understanding of history are doomed to repeat it' which chimes very well with Einstein's definition of stupidity as 'expecting a different result when you do exactly the same thing. Modern history is barely mentioned in high school curricula, let alone ancient or middle age history. And so we repeat it and expect a different result. Vested interests of capitalism, in cahoots with mainstream media outlets which they own and control, have successfully wedged political discourse to the extreme right, leading to the rise of neo-fascism if not neo-Nazism, characterised by extreme nationalism. Caught in their blinkered, neo-liberal, market-obsessed mindset, world leaders have abandoned the middle ground. The vacuum in the middle must be seized and wedged back to the left by a leader of charisma and vision yet to arise We stand on an existential brink of annihilation. Sadly much of the above is reflected in the attitudes visible in society. If everyone was better versed in history, especially its lessons, these incorrect attitudes would not be so prevalent. A very well and informative write up re Ypres and surrounding areas. Having just returned from attending the 100 celebration for VIMY..Canada's massive structure to the April 9th attack..Easter morning that united four divisions..and helped form our young county into one proud Canada ..from sea to sea..it is good to know in these troubled times that our countries who fought and died so far from home ..can always count on each other..here is to our ANZAC mates..now and forever..Less We Forget, well done Ms. Mani. Hi Kate, An absorbing essay. I am Vietnam Veteran .Having myself visited the battlefields of the Western Front to locate my uncle's resting place in the Somme, I asked myself then , as I do each ANZAC Day why? The sight of thousands of neatly laid out gravestones across the fertile fields begged/ begs the question, when will we ever learn? A thoughtful and interesting article. i very much liked the tying in of Brexit, nationalism and refugee issues. very thought provoking.